A woman whose nine-year-old son was struck with a baseball bat in their Newtownabbey home has blamed the UDA for the attack. 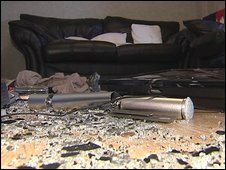 Up to six masked men went through the house at Carmeen Drive in the Rathcoole area at about 0145 BST on Saturday, trashing rooms throughout the property. The boy was kept in hospital for observation overnight, and is staying with relatives following his ordeal. His mother, Lisa Moore, said they would have to move away from the area. "They hit him with a baseball bat but they didn't give any reason why they were in my home - they trashed my home in a matter of minutes," she said. "Now he's scared to go back to his house." She escaped uninjured, and said the men gave no reason why they were attacking her home. 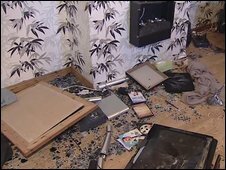 "The only thing left is his TV in the bedroom - they threw his PC to the ground, they smashed toilets, sink, every window in the house. "While my house is in the state it's in, there's no point going back to it because there's nothing there - I may as well move and rebuild a life for myself and my son." Police have appealed for anyone with information to contact them.